The Ultra Trap’s CO2 gas attractant system offers numerous advantages over propane combusted CO2 Traps. 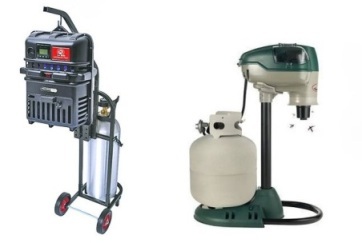 Traps that use propane to generate CO2 can post a fire risk from leaking propane, Coleman voluntarily recalled 136,000 Mosquito Deleto Traps in 2002 because of a potential fire hazard. Propane traps are prone to start-up problems, burnout and blockages, which increase in frequency over time. They require far more maintenance and upkeep and are costly to repair. Use of the optional gas attractant system has been shown to increase capture rates of most mosquito species by as much as 300-400%. While the trap is designed to operate 24/7, the CO2 can be programmed to turn on and off at different times with the overlay timer. This allows the user to manage gas usage and cut down on costs.